Relax in a calm and stunningly beautiful environment close to the cities of Cologne / Bonn / Duesseldorf. This romantic cabin is situated on a 20.000m2 waterfront property in the National Parc Eifel. It combines pure design and authentic country feeling. The city of Heimbach with its medieval castle is close by - just follow the path along the lake which leads you to the old town. In the evening, enjoy a glass of wine in front of your fireplace or unwind in your own private sauna hut. The cabin is newly renovated and first time on the market in 2008. It features a complete kitchen (including espresso machine) and consists of a large living area, an open kitchen and a bathroom. The bed is on a raised platform with panorama windows looking into the woods. Enjoy this unique property in the Eifel mountains. A birdwatchers' paradise offering great sport and wellness opportunities. Sport and Wellness: Watersports (Rowing, Canoeing) directly on the lake. Cycling and walking tracks start from the property - as well as a beautiful jogging route along the shore of the lake (short = 35 min. / medium = 50 min. / long = 75 minutes). Own sauna. Beaches (swimming), sailing and diving on neigbouring lake (ca. 3km). In town: Tennis, heated outdoor swimming pool (May to October), horseback riding, miniature golf. 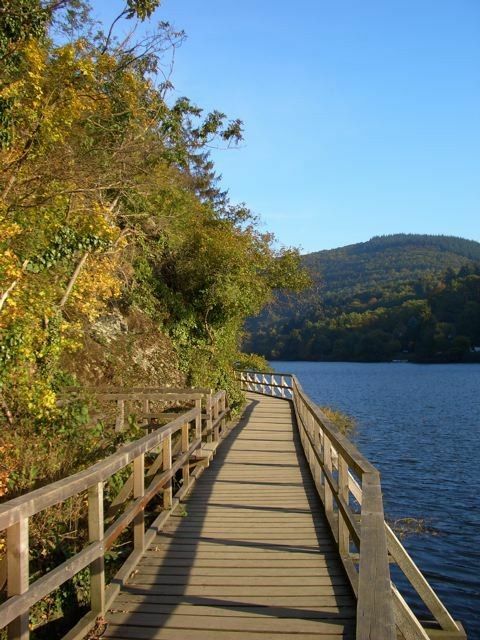 Experinece Nature: The National Parc Eifel starts at the property. It offers unique nature experiences. Discover wild cats, beavers and deer. Watch the fabulous birds (a true paradise for bird watchers). Follow a parc ranger on a guided tour through the woods. Visit the wildlife park in Hellenthal or just enjoy a ride on one of the boats travelling throgh the lakes. Culture and History: Visit Germany's most beautiful energy plant (art nouveau) - home of the international chamber music festival 'Spannungen'. Climb the castles of Heimbach, Nideggen and Monschau. Experience the water museum in Heimbach or the open air museum in Kommern. Stroll through the beautiful old towns of Monschau and Nideggen, visit 'Ordensburg Vogelsang' with its museum covering the years of National Socialism or enjoy one of the numerous concerts in Heimbach, Nideggen and Monschau. Fully equipped bathroom (shower; warm & cold water, heating) and outdoor shower next to the sauna hut. Super Haus, tolle Lage, wahnsinniger Sternenhimmel und eine unglaubliche Stille. Het is een prachtig klein park met erg leuke huizen! Elk met een sauna en haardje! Heerlijk genieten. Het huisje is leuk ingericht en netjes onderhouden en schoon. Vriendelijke eigenaar ook. Je kunt er prachtige wandelingen en fietstochten maken vanuit het huisje. Heimbach is een schattig plaatsje waar je lekker een terrasje kunt pakken. Kortom een aanrader! Thank you very much for the wonderful feedback! We are glad that you enjoyed your stay in our chalet. Hoping to have you with us, again. Ganz herzlichen Dank für das positive Feedback & bis hoffentlich bald in den Herrlichen Aussichten Heimbach. Ganz herzlichen Dank für das tolle Feedback. Wir freuen uns sehr, dass es Ihnen so gut bei uns gefallen hat. Sauna hinterm Haus war sehr schön und angenehm. um etwas Abwechslung zu haben. Aber das Beste war einerseits die Ruhe, und anderseits die Aktivitäten, wie z.b. Radfahren, Rudern oder Wandern im Nationalpark. Ganz herzlichen Dank für dieses tolle Feedback! Wir freuen uns sehr, dass Ihnen Ihr Aufenthalt in den Herrlichen Aussichten Heimbach so gut gefallen hat. Wir hoffen, Sie schon bald wieder zu Gast in einem unserer Nature Chalets begrüßen zu dürfen. Wir haben den Aufenthalt bei Euch sehr genossen. In dem liebevoll eingerichtete Holzhaus Wald-Eck hat es uns an nicht gefehlt und wir haben uns sehr wohl gefühlt. Ganz herzlichen Dank für das tolle Feedback. Freuen uns sehr, dass es Euch so gut bei uns gefallen hat. Bis hoffentlich bald in Heimbach! The cabinn is situated on a 20.000m2 lakefront property, which is part of the Rur-lakes. The largest lake ('Rursee') features sand beach, and offers uniques sailing / windsurfing and diving opportunities. The town of Heimbach (20 min. walk along the lake) is famous for its medieval castle (Burg Hengebach) and offers excellent dining and shopping. Heimbach also offers great sport facilities (swimming pool, tennis, horseback riding, minigolf). In June it is home to 'Spannungen', an international chamber music festival. Nearby are the medieval towns of Monschau and Nideggen as well as the 'Ordensburg Vogelsang'. Phantasialand, Germany's most beautiful fun park (including the Michael Jackson thrillride) is 30 minutes by car. Within one hour you reach the cities of cologne and Bonn as well as the Nürburgring. Bitte beachten Sie: Anreisetage sind ausschliesslich Freitag und Montag. Endreinigung ist im Mietpreis enthalten. Kurtaxe kann vor Ort 1,50€ pro Person pro Nacht entrichtet werden.